Allergic conditions are among the most common medical conditions affecting children in the United States. An allergic condition is a hypersensitivity disorder in which the immune system reacts to substances in the environment that are normally considered harmless. Food or digestive allergies, skin allergies (such as eczema), and respiratory allergies (such as hay fever) are the most common allergies among children. NCHS has put out a report that presents recent trends in the prevalence of allergies and differences by selected sociodemographic characteristics for children under age 18 years. The prevalence of skin allergies decreased with age. In contrast, the prevalence of respiratory allergies increased with age. Food and respiratory allergy prevalence increased with income level. Children with family income equal to or greater than 200% of the poverty level had the highest prevalence rates. 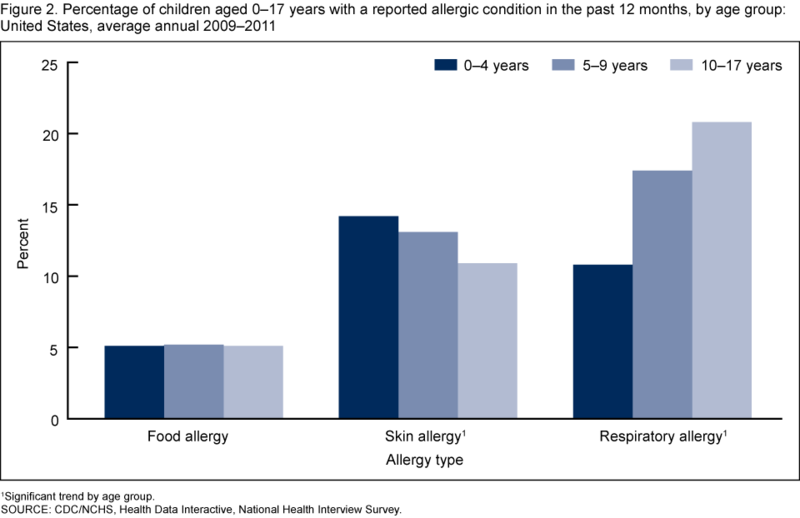 Prevalence estimates for allergic conditions were obtained from the Health Data Interactive (HDI) table, “Allergic conditions, ages 0–17: U.S., 1997–2011,” available from the Health Data Interactive website. NHIS data were used to estimate the prevalence of allergic conditions for this HDI table. This entry was posted on Monday, May 6th, 2013 at 10:29 am and is filed under Uncategorized. You can follow any responses to this entry through the RSS 2.0 feed. You can leave a response, or trackback from your own site.